It is a long time since I have put up Poha/Beaten rice dishes. 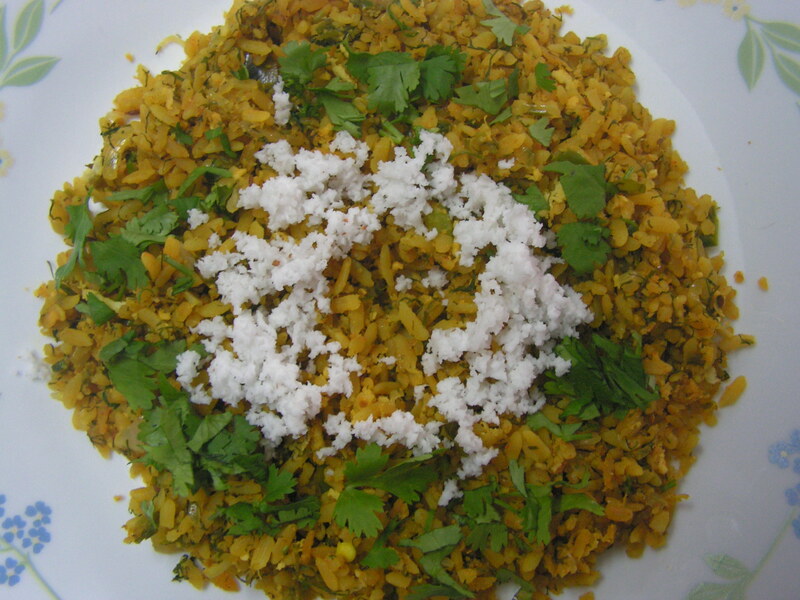 We normally prepare the popular Alu-poha, konkani poha and today I am putting up an interesting variation. Frankly before I tried this I never thought it would turn out so great. I added capsicum for extra flavor to the dish and also in a way we will be relishing poha with veggies ( = healthy !) too instead of the usual plain poha. Here is my version of the dish. 1. Soak poha in water for about 10-15 minutes (if it is medium poha) and drain out the water and keep it aside. 2. Wash and chop dill leaves and capsicum fine and keep aside. 4. When onions turn transparent, add chopped dill leaves & capsicum from step 2 to it and fry till cooked closing it with a lid on simmering the flame. 5. When done, add chili powder and give stir and finally add soaked poha from step 1 to it and stir it and leave it for about 10 minutes. 6. When done garnish with chopped cilantro and fresh grated coconut and squeeze lemon juice too. 1. 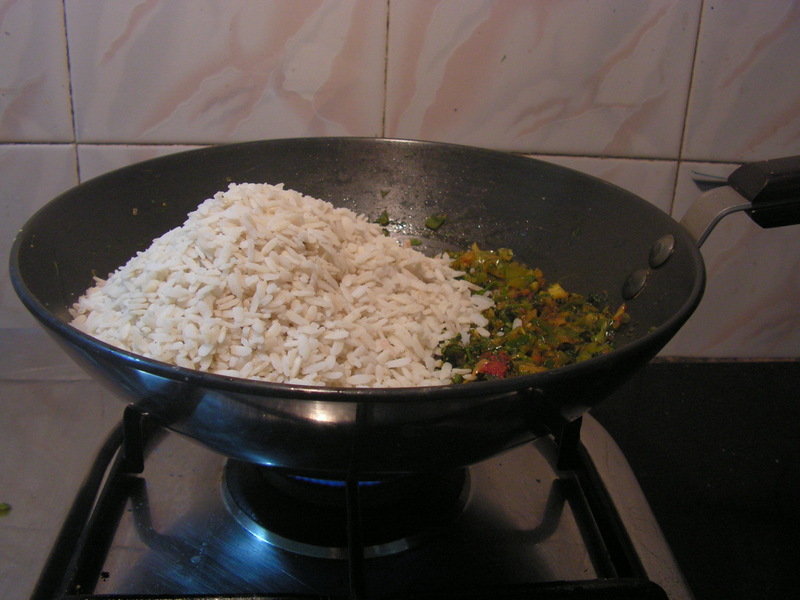 Always use medium poha for the dish – it soaks faster and also cooks faster. 2. One can use any veggie of your choice for the dish in place of capsicum, except it should be something that cooks fast. 3. I did not use green chili since we can’t distinguish these from capsicum. This entry was posted in Uncategorized and tagged Breakfast, Dill leaf dishes, Tiffin. Dill leaves like any other greens is very good from the health point of view. I have put up Dill leaves spicy and sweet idlis which was received very well and today I would like to add yet another rice item to the long list of them. I prepared Dilli leaves Chithranna which turned out great which made me wonder if I would rather put this up sooner than later ! 1. 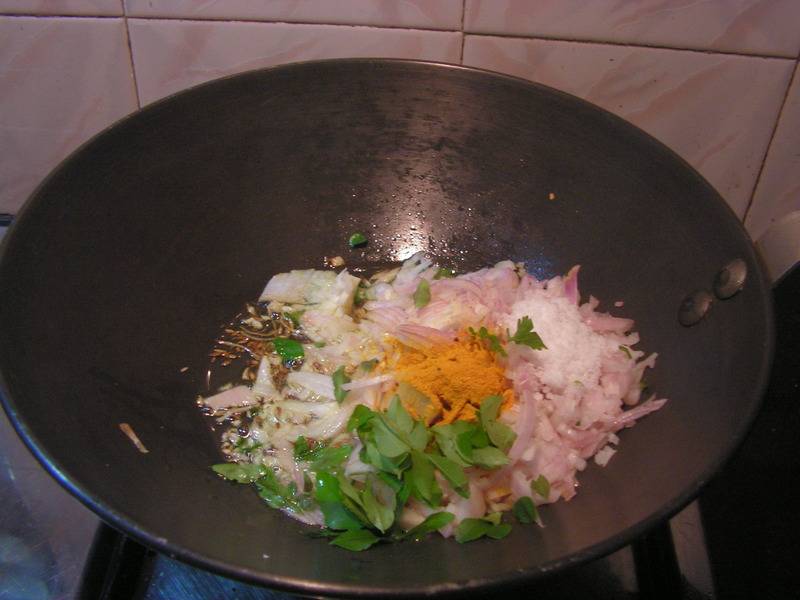 Wash and chop green chillis, Cilantro fine, peal and chop onions fine, grate coconut and keep it aside as shown in the above image. Wash and chop dilli leaves fine as shown in image 1. 2. Wash and drain water from Basumathi rice and keep it aside for a while. Cook it in the as usual for about 20 minutes till done in such a way that the grains are visible when cooked. 3. Place a skillet with 1 tablespoon of oil in it on the medium flame. When heated add mustard seeds when it starts sputtering add black gram dal, cumin seeds to it. 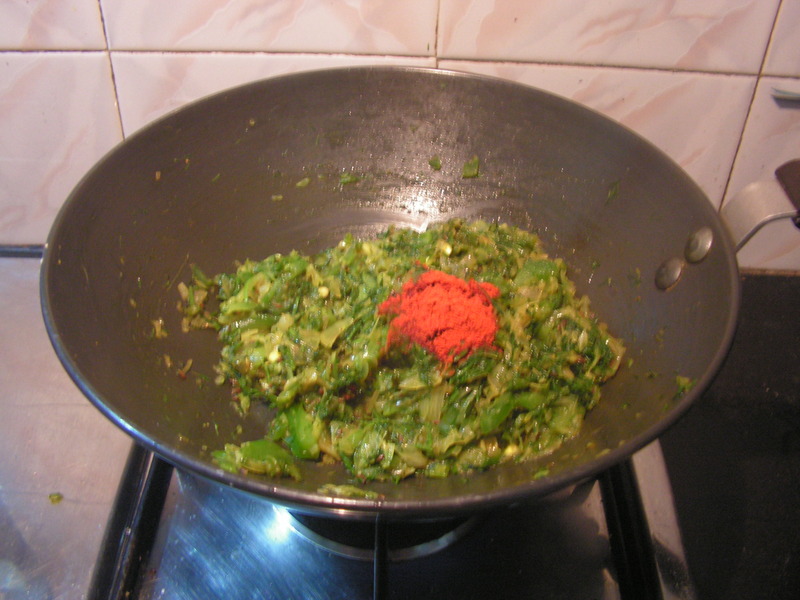 When fried add chopped green chillies and curry leaves from step 1 to it. Now add peanuts and let it fry for a while. 4. When peanuts is fried add chopped onions from step 1 to it and also add required quantity of salt and fresh green peas to it and fry till it turns transparent and also peas turns little soft. Add chopped Dill leaves from step 1 to it and let it cook till done closing it with a lid. 5. 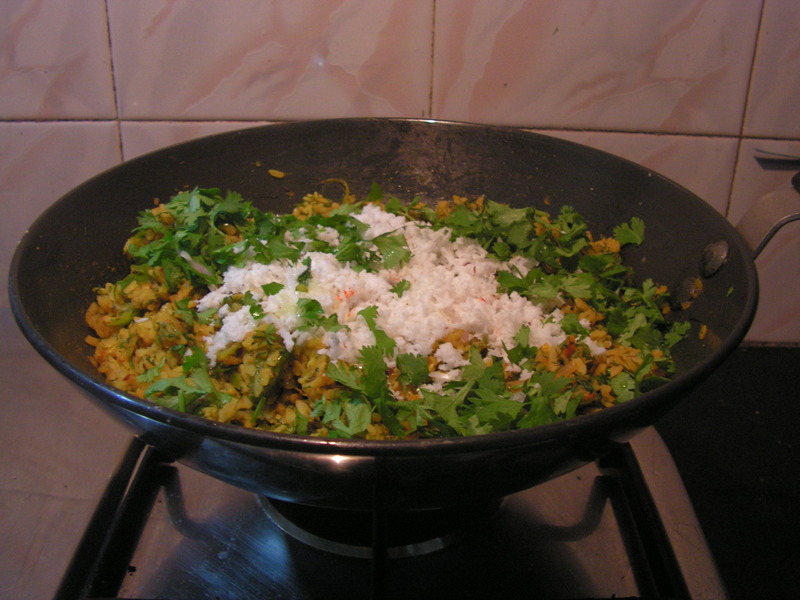 When it is cooked add cooked rice from step 2, chopped cilantro, grated coconut from step 1 to it and stir in well. Squeeze lemon juice as well and mix well. 6. Ready to serve Dill leaves Chithranna is as shown in the image below. This entry was posted in Uncategorized and tagged Dill leaf dishes, One pot meals. My previous recipe here was the Dill leaves Sweet Idlis and in this section I am going to make them a bit spicier. There is a whole bunch of previous Idli recipes here. 1. 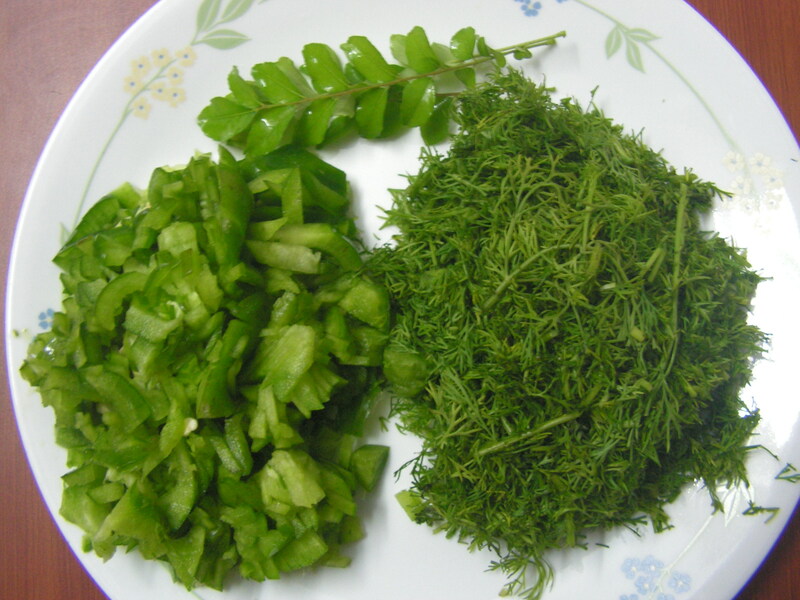 Wash and chop dill leaves fine, grate coconut and keep it aside in a plate as shown in the image 1. 2. Grind grated coconut in the mixer adding water to a fine consistency. Transfer the ground contents to a bowl. 3. Mix rice rawa, chopped dill greens from step 1 to it. Chop green chilli and ginger fine and mix it to the idli mix. Add required quantity of salt to it. 4. Place a spatula with 2 teaspoons of cooking oil in it on medium flame. When heated, add mustard seeds to it. When it starts sputtering add Black gram Dal to it and once fried season it to the idli mix. 5. Grease the Idli mould and fill it with the idly mix. 6. Place it in the cooker and steam it like the usual idlies for about 20 minutes. The steamed idlies is as shown in the image below. Enjoy with wet chutney of your choice or even dry chutney powder. This entry was posted in Uncategorized and tagged Dill leaf dishes, Idlis. Dill leaves ( Sabbasgi in Kannada and Sheppi bhaji in Konkani ) like the other greens is available in plenty these days. Health wise these leave are as good as any other greens. 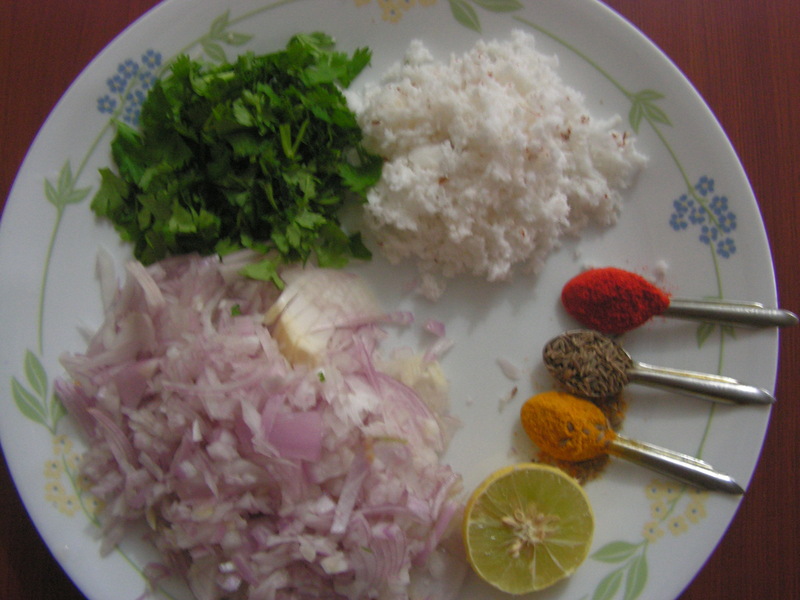 We prepare a few dishes like the idly, Dill leaves Chithranna and dry curry etc. This greens has a unique smell which quite frankly many people may not take too well to. But when I prepared Idly, it turned out great and good enough that I could actually offer to guests. Here they are, the Idlis. 1. 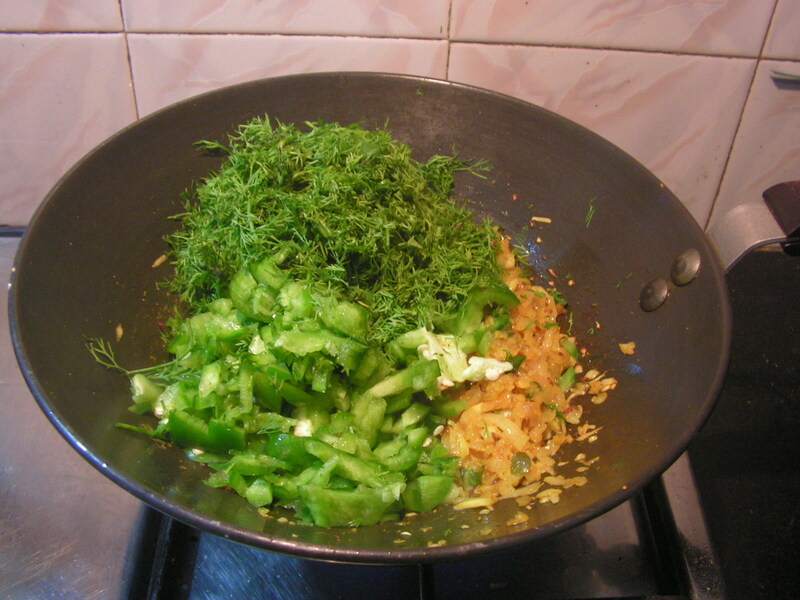 Wash and chop dill green fine, grate coconut, chop Jaggery fine and keep it aside in a plate as shown in image 1. 2. Grind grated coconut and jaggery in the mixer adding water to a fine consistency. 3. Transfer the ground mix to a bowl and mix chopped dill greens cashews, kishmish and a pinch of salt to it and idli mix is as shown in the image below. Keep it aside for about 30 minutes. Sprinkle a little water while filling it into the idli mould. 4. Grease idli mould with a little ghee or butter and fill in the mix . 5. Place the filled mould in the cooker and as usual steam it for about 30 minutes till done. Serve hot with Amul Butter or pure ghee.